It is nostalgically sweet reminiscing over the past events of your life, isn’t it? But the reason why you must be thrilled about it, other than the reality that the scent is fantastic; it is equally, all-natural and gentle, ideal for practically every type of skin above all, it won’t deplete your wallet. For those feeling their skin is under the weather, or perhaps moderately dry due to extended exposure to the elements, this does-it-yourself toner could be the perfect solution to your dehydrated skin back to life. Put the rose petals inside a deep cooking pot or a saucepan, open a little room in the middle so you can put a little ceramic bowl (add some weight in the bowl to prevent from moving around when the water starts to simmer). Then, you can add another bowl over it, this bowl will collect the rosewater you’ll going to make. Now, you can add the water to cover up all the rose petals and over medium heat, bring the water to a simmer and as soon as the rose petals will look discolored, you are ready to put the lid on your pan. The lid will trap all the steam inside the pan, to exaggerate the condensation process, add some ice cubes on top of the lid. The ice cubes will simmer more steam inside the pan; the steam will condensate and it drips right back on in the middle of the bowl. Repeat the ice cube process for about 15 minutes, by adding more ice cubes on the process as it melts. The result is pure-made rosewater by condensation, which is more strong or potent than by boiling down the rose petals. Let the mixture cool down and transfer to a glass container, this mixture can last for a year. Prevent or Reduce Eye Puffiness. 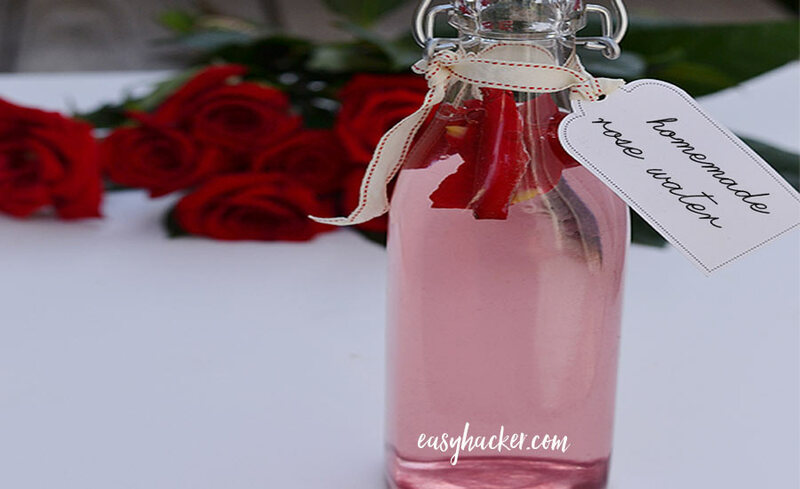 Place the rose water in a mist spray container and use it to freshen your skin instantly. Simply spray rose water mist on your face to instantly freshen your skin and naturally hydrate and nourish your skin, adding wonderful radiance and glow. I, personally, love keeping a bottle of rose water in my fridge in the summer and spray my face with it multiple times throughout the day. Rose water works amazingly as a makeup setting spray. These days you can get rose water in a spray bottle. Keep it on your vanity table and spritz a little bit after you have finished doing your makeup and it will set it into place. It is the best thing to use if you feel that your foundation is a bit powdery or too matte, it will give you a very nice healthy and dewy finish. It can be used as a natural facial toner because rose water helps to absorb excess oil from the skin without leaving a drying effect. Shake the bottle well before use, and apply daily with cotton balls or swabs. Rose water toner is perfect to combat acne.